The Boy is not fond of scratchy wool. Actually most wool to him feels scratchy, but I refuse to send him out in 10-degree weather wearing a cotton hat. So we compromised. I got some delish malabrigo worsted and let him choose between two colors - he chose Oceanos, smart kid that he is. I decided on the Harvard Square Hat pattern from the new IK and a couple days later, cute non-itchy hat. Seriously, the temp this morning was ten degrees, so I layered him up, including the retrofit that I knit out of Cascade 220. He is now requesting an entire malabrigo sweater. There's just something that screams "kid of a knitter" about a 7-year old requested a malabrigo sweater, isn't there? Ok, that is great. I want a Malibrigo sweater too. I itch from pure wool too so I know that awful itching feeling. The hat looks fab, and what a great color he chose too. Is the sweater going to be the same color. Great looking hat and just in time for a few days of cold! Oh, that is SO awesome! 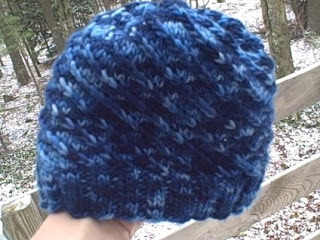 The color and spiral design of the hat is very vibrant - I bet he loves it!